WEST CONSHOHOCKEN, PA USA –In response to standardization requirements of the oil and gas industry, Victrex Polymer Solutions contracted MERL to perform an investigation to evaluate the compliance of VICTREX® PEEK to the NORSOK M-710 Standard for sour (H2S) aging at 1,450 psi (10 MPa) and test temperatures of 175°C (347°F), 195°C (383°F) and 210°C (410°F) for up to five weeks. Results showed no measurable chemical deterioration for the VICTREX PEEK 450G in this time period of testing. This lack of any change, a testament to the H2S resistance of VICTREX PEEK 450G, prohibited any extrapolation or interpolation of results for predictive modelling. 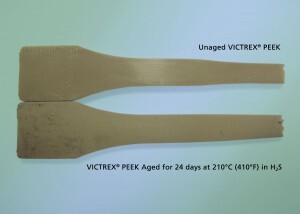 Recognizing the data generated may not go far enough to offer the level of confidence in performance that is required, Victrex has undertaken further testing to understand and model how VICTREX PEEK polymers will perform in even the most demanding oil and gas environments. 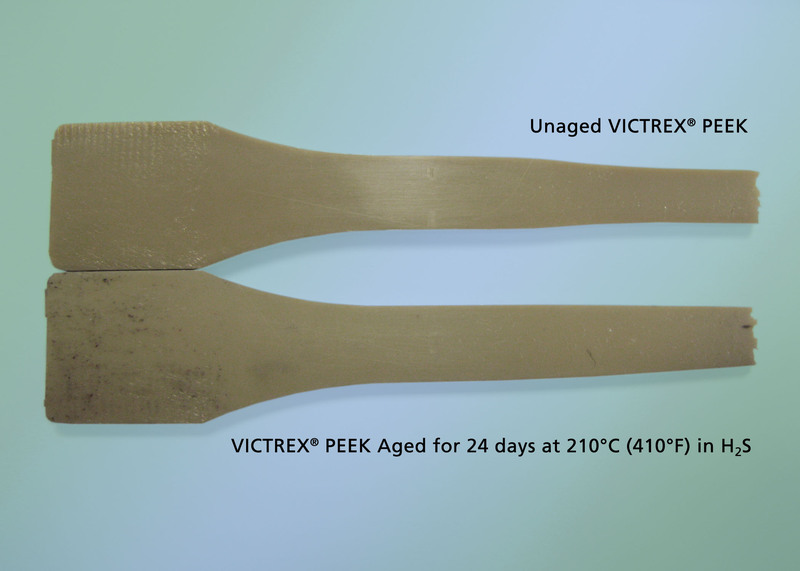 To date, VICTREX PEEK polymer has been tested in three-phase sour environments where the gas phase is 100% H2S corresponding to more than 1% at 30,000 psi (207 MPa) and at temperatures of 220°C (428°F). Even under such unforgiving conditions, ten times the NORSOK standards, the mechanical properties of VICTREX PEEK 450G are fully retained in the aqueous and hydrocarbon phases. This testing is the beginning of a series of additional fluid analysis testing that will be taking place in the coming months in response to direct requests by industry material specifiers and end users to ensure operations are safe and efficient for long service life. To further demonstrate the outstanding performance of VICTREX PEEK polymers and benefit customers in the energy sector; Victrex Technical Manager Geoff Small, is leading a team to test and predictively model VICTREX PEEK polymers in even more aggressive environments. The advanced testing of higher H2S concentrations and additional oil and gas fluids testing is highlighted in a new whitepaper available for download at www.victrexenergy.com.